The aim of this study was to assess the safety measures for patients in hemodialysis units, aiming to improve the quality of medical services provided by the hemodialysis units in Menoufia Governorate and to evaluate hemodialysis units from the safety point of view. Hemodialysis is the most well-established form of treatment for end-stage renal failure. Standard precautions with additional measures are recommended specifically for dialysis centers to prevent transmission of bacteria and viruses from patient to patient. The study was conducted on 19 units of hemodialysis. All patients with end-stage renal disease under regular hemodialysis in these units were included. A questionnaire from the ministry of health and population was used. The percentage of working machines to total machines ranged from 77.4 to 100%. Practicing routine handwashing was 'good' in 60% of units, application of infection control measures was 'good' in half of the units, application of environmental infection control measures was 'good' in 12 units, and waste management was 'good' in 18 units. Workers were totally vaccinated against hepatitis B virus in eight units. Hepatitis B virus-positive patients had complete isolation. The level of safety in the studied units was 'good' in three units and 'fair' in 16 units. More than 25% of the dialysis machines exceeded the recommended working hours/duration. Personal protective clothes and cleaning materials were available with shortage in usage. There was a shortage in the medical staff, especially in governmental hospitals. There was shortage in infrastructure of the most of dialysis units. Loss of kidney function leads to uremic syndrome, a complex phenomenon involving dysfunction of many organ systems in the body. This can be improved with hemodialysis therapy . Hemodialysis is the most well-established form of treatment for end-stage renal failure. Enormous technological advances have been made since the introduction of this form of treatment over 30 years ago . Patients undergoing hemodialysis are at risk for bloodstream infections and preventing these infections in this high-risk population is a national priority . Infectious complications of hemodialysis include bacterial infections caused by contaminated water or equipment, other bacterial infections (including vascular access infections), and blood-borne viruses [primarily the hepatitis B virus (HBV) and hepatitis C virus] . Standard precautions with additional measures are recommended specifically for dialysis centers to prevent transmission of bacteria and viruses from patient to patient. These precautions include routine use of gloves, handwashing, and cleaning and disinfection of the external surface of the dialysis machine and other environmental surfaces. In addition, preventing transmission of HBV infection requires vaccination of susceptible patients and staff, avoiding dialyzer reuse, and use of a dedicated room, dialysis machine, and staff members when treating patients chronically infected with this virus . Several lines of investigations, including surveys of patients and dialysis professionals, have helped identify important areas of safety risk in dialysis facilities. Among these are lapses in communication, medication errors, patient falls, errors in machine and membrane preparation, failure to follow established policies, and lapses in infection control . The quality assessment and performance improvement process should include a dedicated safety team to focus on specifically identified areas of risk and to establish outcome goals guided by best practices and agreed-upon measures of success. A safety questionnaire can be given to patients and staff and the responses evaluated to improve understanding of the prevailing attitudes and concerns about safety . By sharing these results, openly acknowledging the challenges, and using a blame-free root cause process to identify the action plan, the facility can establish a culture of safety . After obtaining approval by the Hospital Ethics Committee, and written informed patient consent with an explanation regarding the purpose, methods, effects, and complications. This study was conducted in 19 units of hemodialysis in Menoufia Governorate, Egypt. All patients with end-stage renal disease under regular hemodialysis in these units were included. A questionnaire from the Ministry of Health and population was used. This questionnaire asks about the control measures in hemodialysis units that are considered as some of the most important areas of safety risk in dialysis facilities. All units throughout the period of search were visited. About two-thirds of these units were working three shifts, whereas the other third of the units were working only two shifts. The number of hemodialysis machines found in the units that worked three shifts ranged from ~25 to 60 machines to dialyze about 70 to 220 patients, whereas in the units working two shifts, the number of machines ranged from 7 to 12 machine to dialyze about 25 to 30 patients. The number of physicians in these hemodialysis units ranges from 3 to 16. In most of these units, only one physician supervises and follows up the patients who are present per shift. The number of nurses in the large units ranged from about 15 to 45, whereas in small units, only two or three nurses worked in these units. There were 5–15 nurses per shift in large units, whereas only one nurse was present per shift in small units. The number of workers in the units ranged from 2 to 7 workers. The questionnaire is divided into sections: general personal protection, methods for preventing pollution, dealing with furniture and sheets, environment cleansing, dealing with waste products, occupational health, isolation, and records. The process of hemodialysis in these units has been monitored from the start of shifts to the end to be able to assess all the infection control aspects and the defects in these units. All data were collected, tabulated, and statistically analyzed using statistical package for the social sciences 19.0 for Windows (SPSS; SPSS Inc., Chicago, Illinois, USA) and MedCalc 13 for Windows (MedCalc Software BVBA, Ostend, Belgium). Descriptive statistics (e.g., percentage, mean and SD). Analytic statistic, included the t-test, which was the test of significance used for comparison between two groups having normally distributed quantitative variables and P value of 0.05 was considered statistically significant. This study was conducted in 19 units of hemodialysis in the Menoufyia Governorate. The percentage of working machines to total machines ranged from 77.4% in (Shebin Elkom Teaching Hospital) up to 100% in the majority of the studied units (16/19) [Table 1]. There was no significant differences between the mean of total machines and the mean of working machines in different dialysis units as shown in [Table 2]. Regarding the handwashing practice, the presence of soap and basin was achieved in all units, whereas the practice of hand swabbing by antiseptics among the working staff was to some extent in 89.5% and good in 10.5%. The availability of antiseptic was good in 78.9% and to some extent in 21.1%. In contrast, drying of hands after wash was bad in 73.7%, to some extent in 21.1%, and good in 5.3% [Table 3]. Regarding infection control measures, the disposal of unused sterilized cotton after each patient and disinfection of patient skin was achieved by 100%. The medical infusion drip stands were mounted only with administered infusion to the patient, whereas the presence of enough sterilized cotton for one patient was achieved 'to some extent' in 78.9% and was 'good' in 21.1%. 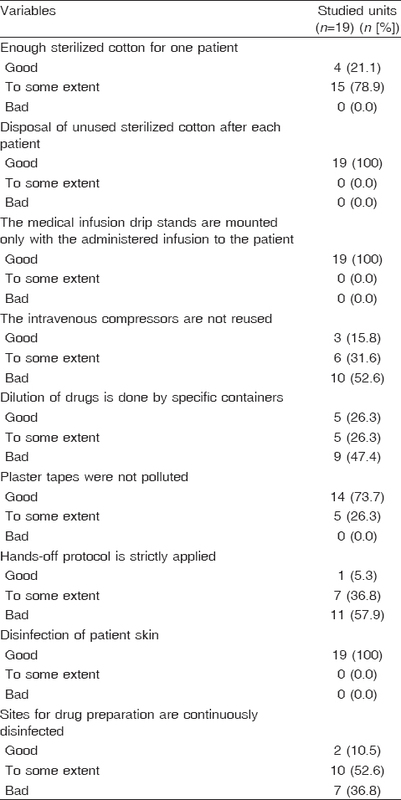 Non-reuse of intravenous compressors was 'bad' in 52.6%, 'to some extent' in 31.6%, and 'good' in 15.8%. Hands-off protocol was 'bad' in 57.9%, 'to some extent' in 36.8%, and 'good' in 53%. The presence of containers for dilution of drugs was 'bad' in 47.4%, 'to some extent' in 26.3%, and 'good' in 26.3%. Unpolluted plaster tapes were 'good' in 73.7% and 'to some extent' in 26.3%. 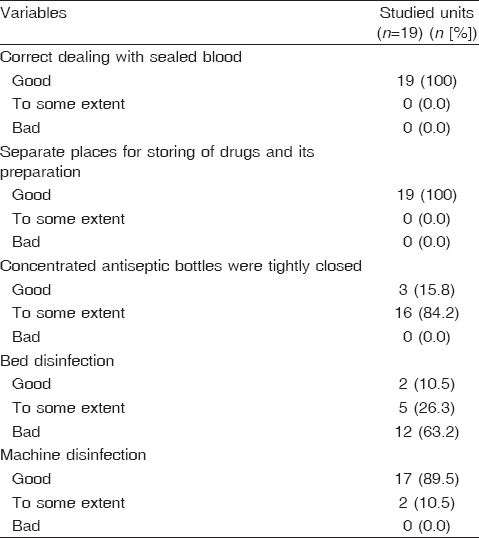 Continuous disinfection of sites for drug preparation was 'to some extent' in 52.6%, 'bad' in 36.8%, and 'good' in 10.5% [Table 4]. Regarding environmental infection control measures, the application of correct dealing with sealed blood, a separate place for storing drugs and its preparation was good in 100%, whereas machine disinfection was 'good' in 89.5% and 'to some extent' in 10.5%. Bed disinfection was 'bad' in 63.2%, 'to some extent' in 26.3%, and 'good' in 10.5%. The practice of tightly closing concentrated antiseptic bottles were found 'to some extent' in 84.2% and was 'good' in 15.8% [Table 5]. Vaccination of workers against HBV was totally achieved in 42.1% and partially achieved in 10.5%. No one was vaccinated in 47.4% of the units. 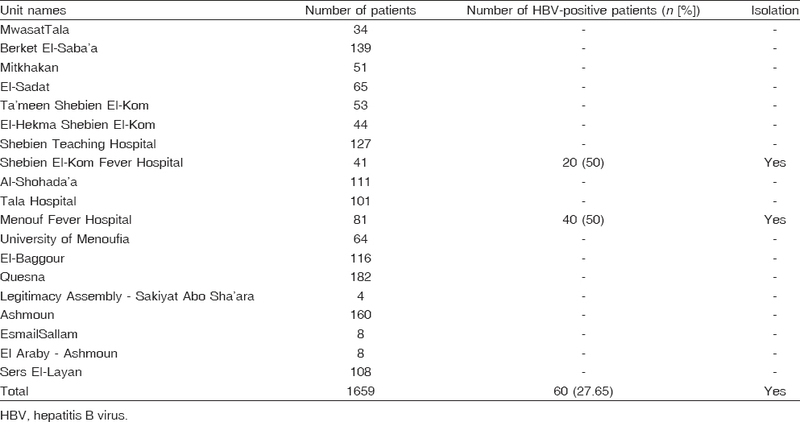 The number of HBV-positive patients was 50% of the total number of patients in two units and 27.65% of the total number of patients in the governorate. There was complete isolation of these patients from uninfected patients [Table 6]. Regarding the level of safety in the studied units, the total score of the 43 questions was 86. Units that scored less than 52 (60%) were considered to have poor safety, whereas units with scores ranging from 52 to 68 (60–80%) were considered to have fair safety. Units with scores more than 68 (>80%) were considered to have good safety. About 84.2% of the studied units had fair safety, whereas 15.8% of them had good safety. No unit was found to have bad safety [Table 7]. This study was conducted to assess safety measures for patients in hemodialysis units aiming to improve the quality of medical services provided by the hemodialysis units in Menoufia Governorate and to evaluate hemodialysis units from the safety point of view. The total number of hemodialysis units was 19 units: six units in Shebin Elkom, four units in Ashmoun, two units in Tala and one center in multiple cities. The total number of machines was 364. The largest unit was in Ashmoun (50 machines) and the smallest was in the Legitimacy Assembly – Sakiyat Abo Sha'ara in Ashmoun (five machines). The mean number of machines per unit was 20.47 with a SD of 11.15. 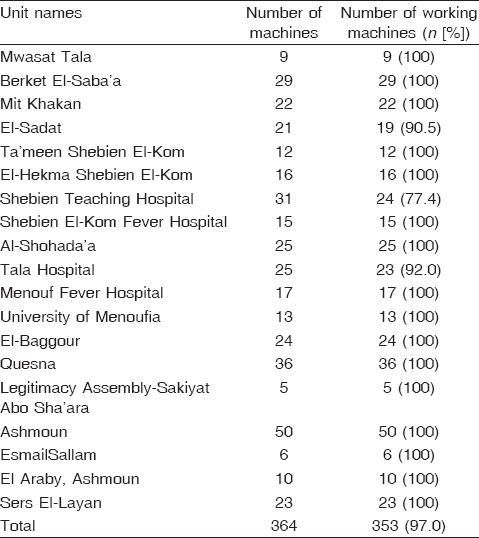 The percent of working machines ranged from 77.4% in Shebin El-Kom Teaching Hospital to 100% in the majority of the studied units (16 out of the studied 19 units) and the mean%±SD of working machines was 19.89 ± 10.86. Each machine requires at least 11 × 10 ft (100–110 ft 2). This is needed in emergency situations . When comparing these results with those obtained from another study for the assessment of safety measures in hemodialysis units in Ismailia Governorate, it was found that the working machines ranged from 63.3% to 100% of working machines in the majority of studied units (7/9). Comparing handwashing practice in our study with that in the study by Kim et al. 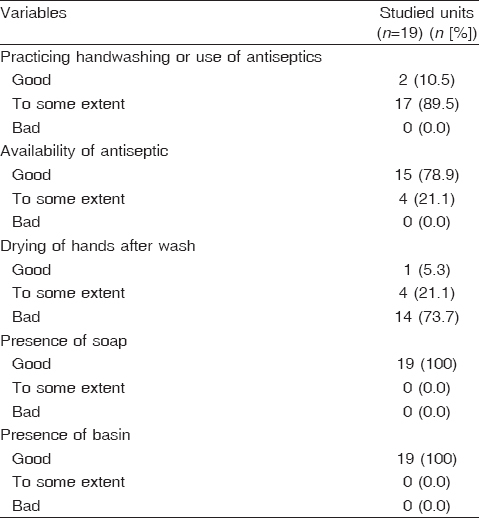 , the overall compliance of handwashing was 22.1% in the Kim study, whereas Packer et al. found that healthcare workers in Canada reported a high rate of handwashing before and after dealing with all patients (93.5%). In Gajić et al. 's  study, 73% of healthcare workers protected themselves with gloves, 11% used masks, and only 2% used glasses. In a national survey throughout England, 99% of the participants routinely used gloves, but only 18% used face mask and 21% used eye protection . International guidance suggests that changing of gloves is necessary between episodes of care for different patients to prevent transmission of infectious material  and during the care of a single patient to prevent cross-contamination of body sites . In our study, disposable of gloves after each use is achieved 'to some extent' in 52.6% and was 'good' in 47.4%. With regard to infection control measures, our results were different from those of Rutula and colleagues in 2008. In their study, all single-use injectable medications and solutions should be dedicated for use on a single patient and delivered separately to each patient and medications were taken to the patient area or dialysis station and used only for one patient and not used for other patients. This was achieved in 89%. Sterile infusion fluids, administration sets (intravenous tubings), and unpolluted connections were achieved in 80%. Common carts were not used within the patient area to prepare or distribute medications. In this study, a hands-off protocol was strictly applied in bad quality in 57.9%, 'to some extent' in 36.8%, and 'good' in 5.3%. Immunization against HBV was carried out in all healthcare workers including students, trainers, and staff working in laboratories attached to renal units, who have direct contact with the patient . In our study, all patients on dialysis received HBV vaccine, but this is different from the study by Levin et al. , where 45–66% of patients with renal failure developed response with conventional doses of vaccine; however, increased response rates of 75–85% have been reported when 40 mg doses of vaccine have been used. Patients on Hemodialysis (HD) should be screened for HBV and hepatitis C virus infection before the initiation of HD and monitored every 3–6 months . Seropositive patients were dialyzed on dedicated machines either in an isolated area or alongside seronegative patients if space does not allow isolation . In the Ismailia Governorate, vaccination of all employees against HBV was achieved in 100%. The recommendations proposed by Fabrizi et al. were complete isolation of HBV-positive patients, use of dedicated dialysis machines, and regular surveillance for HBV infection. HBV-positive patients received dialysis in two units only, and comprised 50% of the total patients in these units (Shebin El-Kom Fever Hospital, Menouf Fever Hospital). They compromised 27.65% of total patients in the Governorate. Complete isolation of these patients from other patients was found. From the safety point of view, 84.2% of the studied units had fair safety, 15.8% had good safety, and 0% had bad safety. In the Ismailia Governorate, 66.7% had fair safety, 33.3% had good safety, and 0% had bad safety. In the end of the study, the best unit for achieving infection control measures was in Alaraby Hospital at 97.6%. The worst unit was in Ta'meen Shebin Elkom Hospital, which achieved 65.1%. The mean for achieving infection control was 62%. More than 25% of the dialysis machines exceeded the recommended working hours/duration. Personal protective clothes and cleaning materials are available with shortage in usage. There is a shortage in the medical staff, especially in governmental hospitals. There is shortage in infrastructure of the most of the dialysis units. Kinchen K, Sadler J, Fink N. The timing of specialist evaluation in chronic kidney disease and mortality. Ann Intern Med 2002; 137:479–486. Desmet C, Beguin C, Swine C. Falls in hemodialysis developing national evidence-based guidelines for preventing healthcare associated infections. Phase 1: guidelines for preventing hospital-acquired infections. J Hosp Infect 2005; 47:S3–S82. Patel P, Thompson N, Kallen A. Epidemiology, surveillance and prevention of hepatitis C virus infections in hemodialysis patients. Am J Kidney Dis 2010; 56:371–378. O'Grady N, Alexander M, Burns L. Guideline for the prevention of intravascular catheter-related infections. Clin Infect Dis 2011; 52:e162–e193. Grabsch EA, Burrell LJ, Padiglione A. Risk of environmental and healthcare worker contamination with vancomycin-resistant enterococci during outpatient procedures and hemodialysis. Infect Control Hosp Epidemiol 2006; 27:287–293. Kurella M, Chertow G, Fried L. Chronic kidney disease and cognitive impairment in the elderly: the health aging and body composition study. J Am Soc Nephrol 2005; 16:2127–2133. Ward R, Greene T, Hartmann B, Samtleben W. Resistance to intercompartmental mass transfer limits beta-2-microglobulin removal by post-dilution haemodiafiltration. Kidney Int 2006; 69:1431–1437. Arenas M, Sanchez-Paya J, Barril G, Garcia-Valdecasas J, Gorriz J, Soriano A, et al. A multicentric survey of the practice of hand hygiene in haemodialysis units: factors affecting compliance. Nephro Dial Transplant 2005; 20:1164–1171. Crooks P, Jaber B, Johnson C, Michael M, Pereira B, Uhlig K, et al. US commentary on the KDIGO clinical practice guideline for the prevention, diagnosis, evaluation, and treatment of hepatitis C in CKD Am J Kidney Dis 2008; 52:811–825. Kim P, Roghmann M, Perencevich E, Harris A. Rates of hand disinfection associated with glove use, patient isolation, and changes between exposures to various body sites. Am J Infect Control 2003; 31:103–197. Parker M, Goldman R. Pediatric emergency department staff perceptions of infection control measures against severe acute respiratory syndrome. Emerg Med J 2006; 23:349–353. Gajić Z. Health care workers and exposure to blood-borne infections. Arh Hig Rada Toksikol 2013; 64:145–151. Sundaram R, Parkinson R. Universal precaution compliance by orthopedic trauma team members in a major trauma resuscitation scenario. Ann R Coll Surg Engl 2007; 89:262–267. Pratt R, Pellowe C, Loveday H. The epic project: developing national evidence-based guidelines for preventing healthcare associated infections. Phase 1: guidelines for preventing hospital-acquired infections. J Hosp Infect 2001; 47:S3–S82. Boyce J, Pittet D. Healthcare Infection Control Practices Advisory Committee. Guideline for hand hygiene in health-care settings. Recommendations of the Healthcare Infection Control Practices Advisory Committee and the HICPAC/SHEA/APIC/IDSA Hand Hygiene Task Force. MMWR Recomm Rep 2002; 51:1–45. European Best Practice Guidelines. Prevention and management of HBV, HCV and HIV in HD patients. Nephrol Dial Transplant 2002; 17:72–87. Alashek W, McIntyre C, Taal M. Provision and quality of dialysis services in Libya. Hemodial Int 2011; 15:444–452. Fabrizi F, Messa P, Martin P. Transmission of hepatitis C virus infection in hemodialysis: current concepts. Int J Artif Organs 2008; 31:1004–1016.